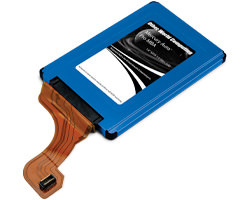 This is a 1.8" 120gb Solid State Drive for the MacBook Air 2008/2009 model. When only the fastest and most reliable Solid State Drive on the market today will suffice for your data storage and backup, look no further than the OWC Mercury Aura Pro SSD. Go ROUGHER NO Moving Parts for reliability up to 100X higher than hard drives.